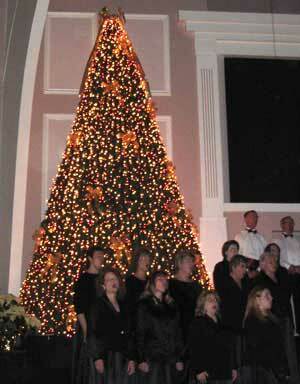 Grace Church of the Nazarene is using the MidiLite for twin Christmas Trees. Unlike many of our users, their trees don't have people in them, they are just for decoration and lights. Shown in the photo is just one of the trees on the left side of the stage. Visit their web site for more information about Grace Church of the Nazarene.